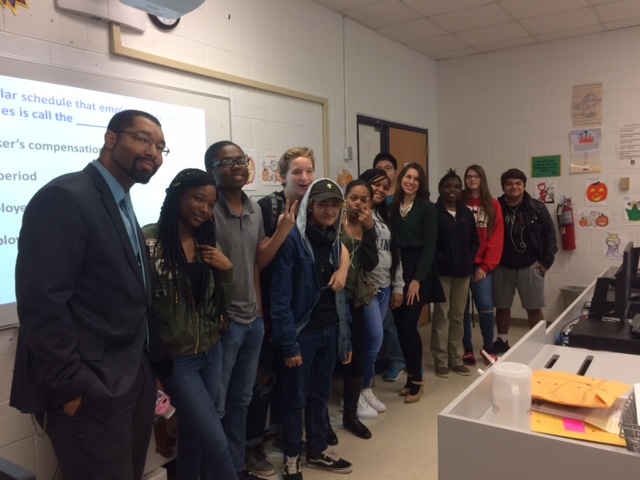 On Tuesday, November 6th, Sonya Jones and Michael Williams, associates of the Fidelity Bank Durham, NC location, visited a personal finance class at Riverside High School as part of the NC Bankers in School Program. The NC Bankers in School Program was created by the North Carolina Bankers Association and provides bankers with curriculum and teaching aides to use in the classroom. Sonya and Michael played a financial game with the students that helped give them a perspective on how the decisions they make now will influence their personal finances in the near future. The students at Riverside High School appreciated the visit from the Fidelity Bank associates and enjoyed learning tips to help them build a strong financial foundation.